Brisbane, the third largest city of Australia and also the state capital of Queensland, is bracing for once-in-a-century floods. On Wednesday, a number of streets in Brisbane’s Central Business District (CBD) were flooded with water, and many homes and businesses along Brisbane River have also been inundated. The flood-hit city, with a population around 2 million, is bracing for the peak wave to come. Local officials announced that the peak was expected to come at around 04:00 a.m. local time on Thursday. In Brisbane CBD, which was out of power on Wednesday morning, the busy and prosperous city was almost empty. Shops were closed and sandbags were seen on the game of many shops, hotels and other buildings. A police officer said they were very busy in the last few days, fencing off streets or guiding people to walk safely in the flooded areas. 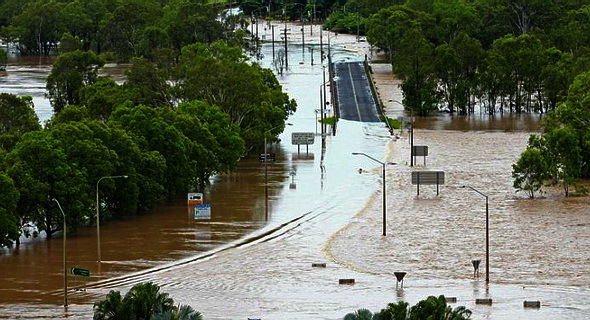 The worst affected areas are around the banks of the river in Brisbane, with ground floors of many homes and buildings being submerged in the water. Hundreds of residents have been evacuated to the shelters by the State Emergency Service staff. The rain has been pouring continuously in eastern Queensland for the last 40 days. Many towns and farm land in central and southeastern Queensland have been swamped.